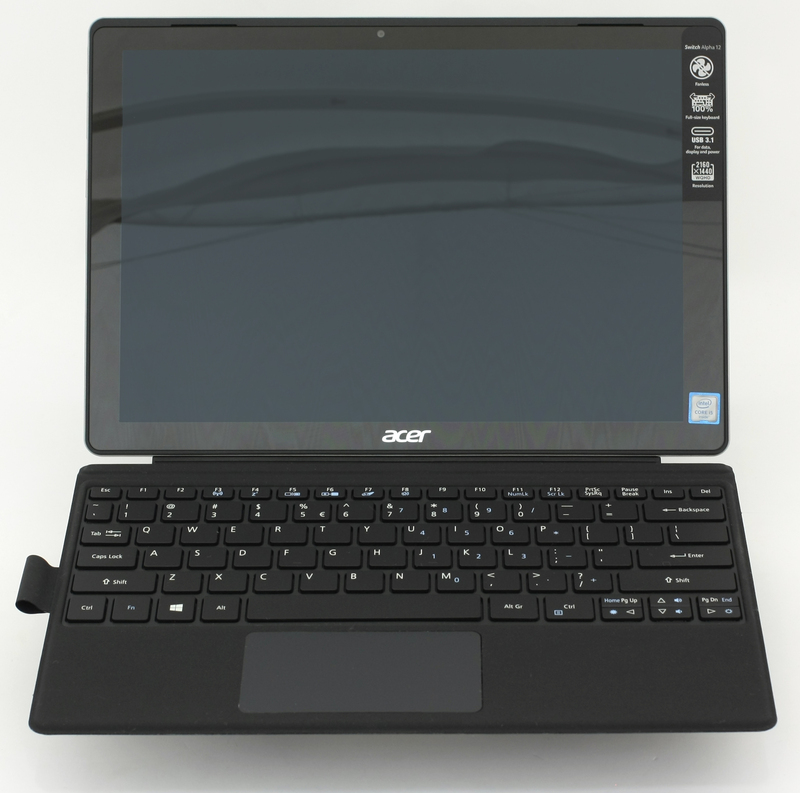 Acer has been releasing Aspire Switch devices for quite some time now and we’ve seen a steady increase in overall usability, design, quality etc. But since their last announcement at [email protected] conference in New York, the Aspire Switch lineup has matured enough to a point when the latest Switch Alpha 12 can actually replace your notebook. It sure is a 12-inch hybrid device but the notebook-class CPU inside puts it in a class of its own. 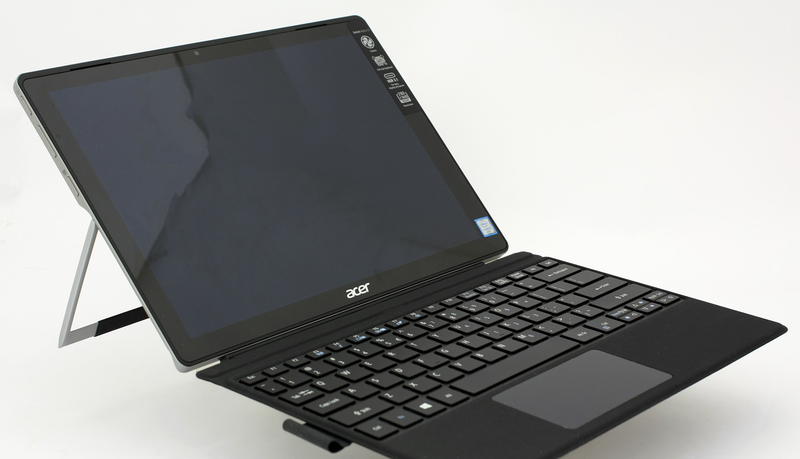 How Acer managed to pull this off? Well, the company’s engineer team came up with a clever way to keep the CPU cool during load without the need of a fan. So the cooling design is able to support Intel’s ULV (ultra-low voltage) Core i family with the so-called “LiquidLoop” technology, which we will discuss later in our review. The unit we are currently testing uses a Core i5-6200U chip but you can go up to Core i7-6500U if you want to. The list goes on with a stylus, flip cover keyboard, which is quite comfortable, and a WQHD screen with 2160×1440 resolution, sturdy kickstand, and all-aluminum design. With specs sheet like this, the device can easily go against Microsoft’s premium Surface Pro 4. 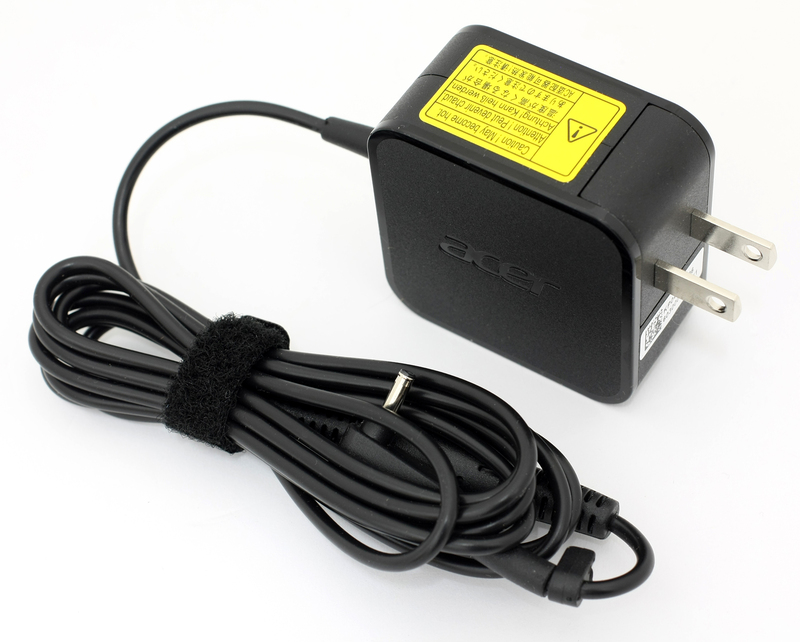 The package includes the device itself along with the AC adapter, keyboard, stylus and the usual user manuals. The new Switch Alpha offers a design we haven’t seen before from this lineup. All-aluminum premium looks with a bit hefty chassis, which is quite understandable given the hardware crammed up inside. 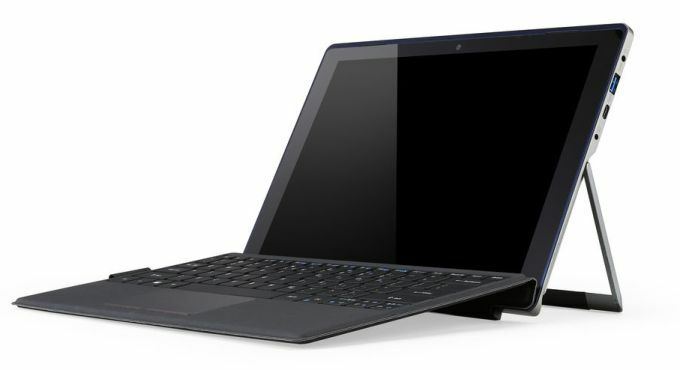 The tablet weighs around 900 g and when you add the keyboard, the whole device stops at 1.25 kg. It might not seem as much, but compared to other 12-inch devices, it definitely drags behind. We’ve reviewed lighter 12 and 13-inch full-sized laptops that are lighter. But we can definitely give it a pass considering the rest of the perks. Let’s start with the back of the device. 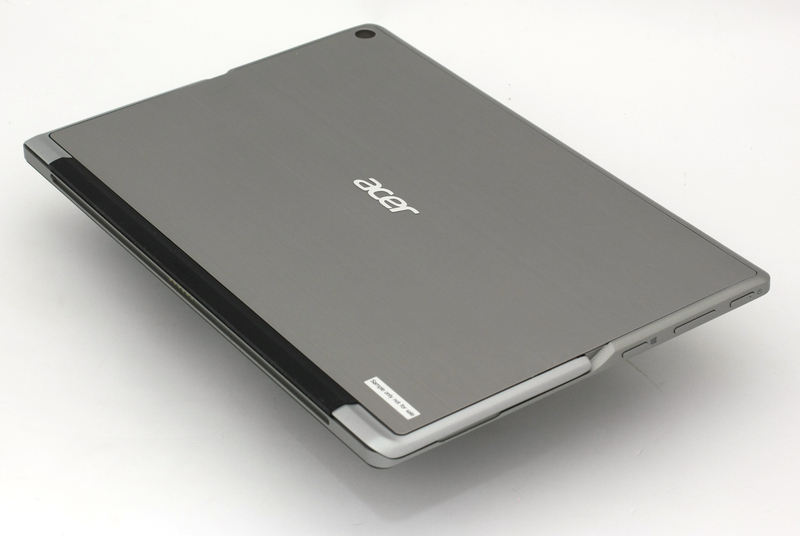 It has a brushed-aluminum plate with Acer’s logo in the middle and a plastic strip going around the top edge. It’s probably placed there for better Wi-Fi reception as metal tends to block the signal. You will also find the camera on the upper-left corner. Whereas the bottom edges adopt a sturdy, metal kickstand with silicone cover on the bottom so it won’t slip accidentally. You can use it all the way up to 165 degrees incline so it will stand comfortably on your desk or on your lap. The latter, however, might feel awkward for some since the body of the whole device isn’t as wide as a conventional laptop. 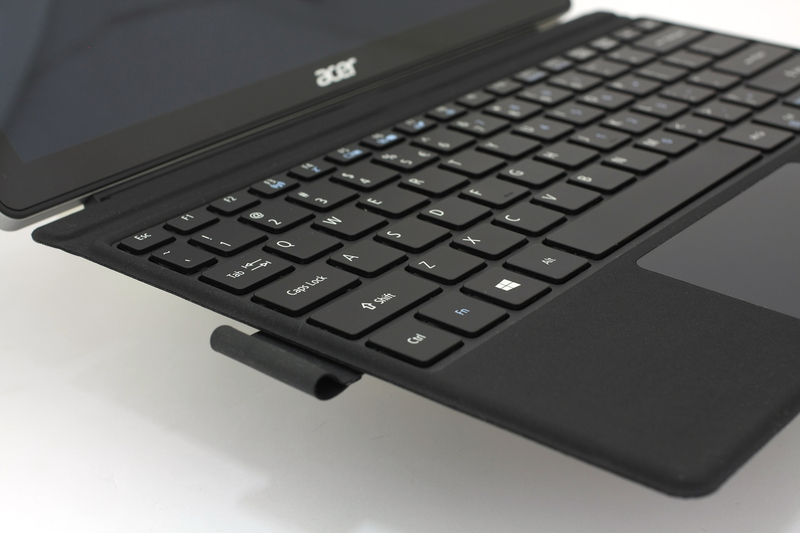 Acer also claims that the kickstand provides better stability than its competitors (probably the Surface Pro 4) and withstands greater touch force. One thing is for sure, though, it definitely feels secure enough for any kind of use. And the front leaves us with the 12-inch screen featuring an unusual QHD (2160×1440) resolution with 3:2 aspect ratio and fairly thin top and bottom bezels but the same cannot be said about the side ones. The front-facing stereo loudspeakers are discretely positioned above the top bezel and between them you will find the webcam. 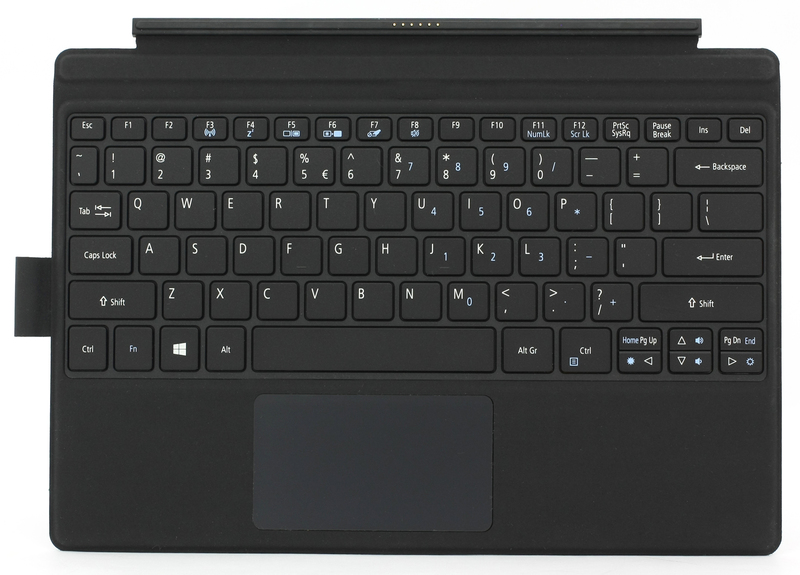 The sides are thin – 10.16 mm and go up to 15 mm when the keyboard is attached. We are quite impressed by the thickness considering the liquid-cooled Core i5 CPU inside. It still provides some connectivity options – 3.5 mm audio jack, USB 3.0 and USB-C 3.1 on the right whereas the left side only holds the dedicated Windows button, volume rocker, and power key. So if you need to connect an external display, which you’d probably going to do at some point considering the computing power of the device, you’ll have to use the USB-C port that supports Thunderbolt standard. You can get a USB-C to HDMI adapter, for example, or a USB-C compatible monitor. And the bottom has a 6-pin connector for the keyboard. Speaking of which, it snaps quite easily and securely thanks to the magnets on both parts. It’s hard to miss the pins because when you bring the tablet near the keyboard, it snaps instantly. The dock itself is made of soft-touch fabric of some sort and it’s pleasant to touch. 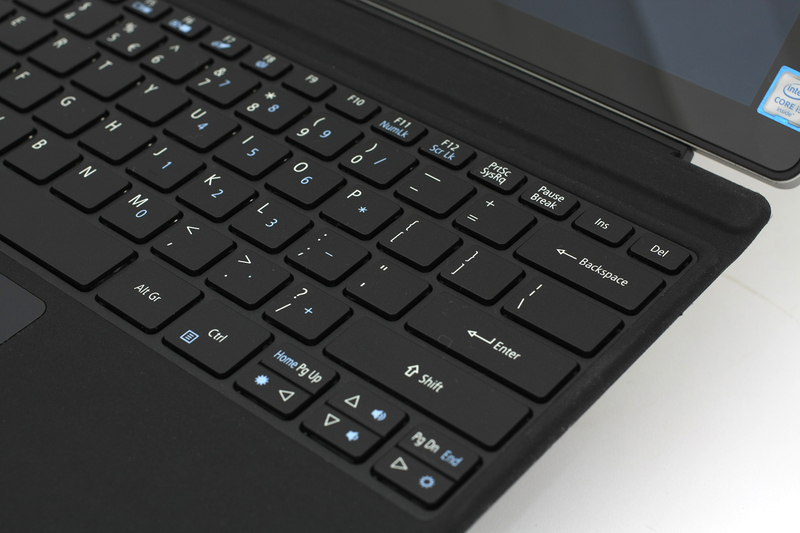 It accommodates a keyboard with decent key travel, wide enough spacing and makes most out of the limited space. The keys stretch to the edges and include an “F” row as well. It feels really comfortable while typing and you won’t miss the full-sized keyboard when you adjust to this one for sure. The touchpad, on the other hand, is quite small. You will have to use it with high sensitivity to make most of the trackpad area and sometimes doesn’t register small finger movements making the experience a bit erratic. However, it compensates with stability when clicking. We didn’t notice any unusual behavior or wobbling, which is really important. For a tablet, the Aspire Switch Alpha is pretty hefty and bulky but that’s somehow overshadowed by the fact that the device features a dual-core notebook processor (up to Core i7-6500U) so there’s not enough room for complaints. Also, the chassis and the kickstand feel pretty sturdy and will most likely endure time. 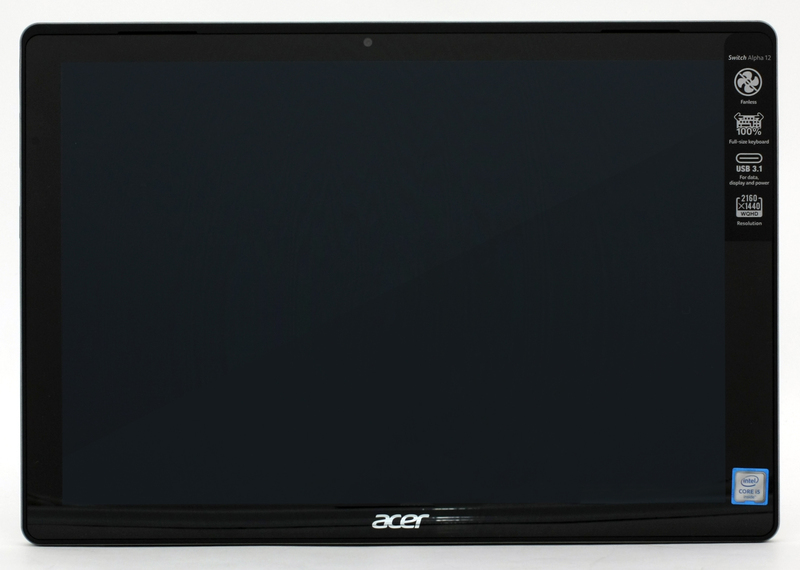 The Aspire Switch Alpha 12’s display is manufactured by Panasonic with model number VVX12T041N00. It uses an IPS touchscreen with QHD (2160×1440) resolution with the unusual aspect ratio of 3:2. This leads to a pixel density of 216 ppi and 0.117 x 0.117 mm pixel pitch. The display can be considered as “Retina” when viewed from a distance equal or greater than 40 cm. 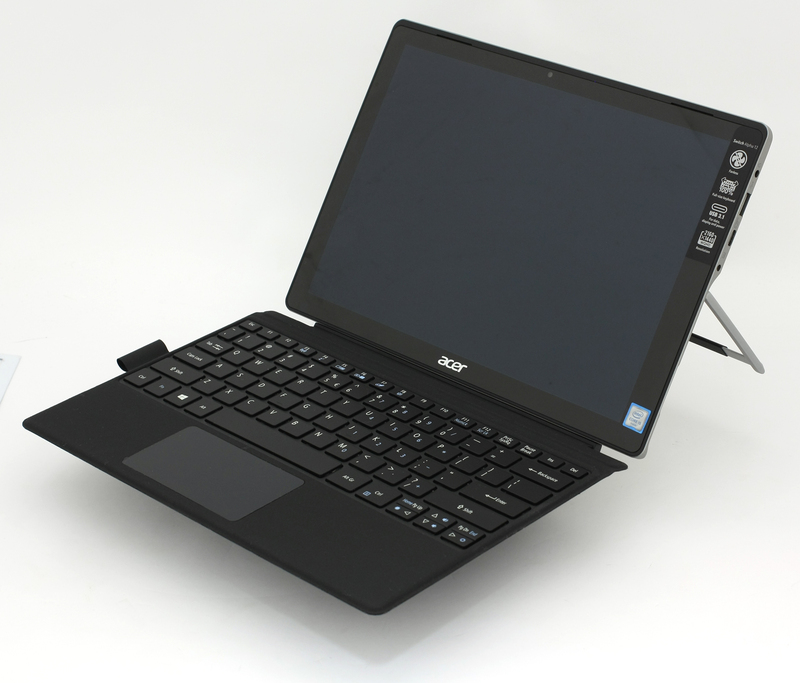 The display has comfortable viewing angles from a 45-degree angle. We were able to detect pretty decent maximum brightness – 361 cd/m2 in the middle of the screen and 338 cd/m2 as an average value leading to 14% maximum deviation. The color temperature is 7510K in the center and 7440K average across the surface meaning that colors will appear slightly colder than the standard 6500K white point. 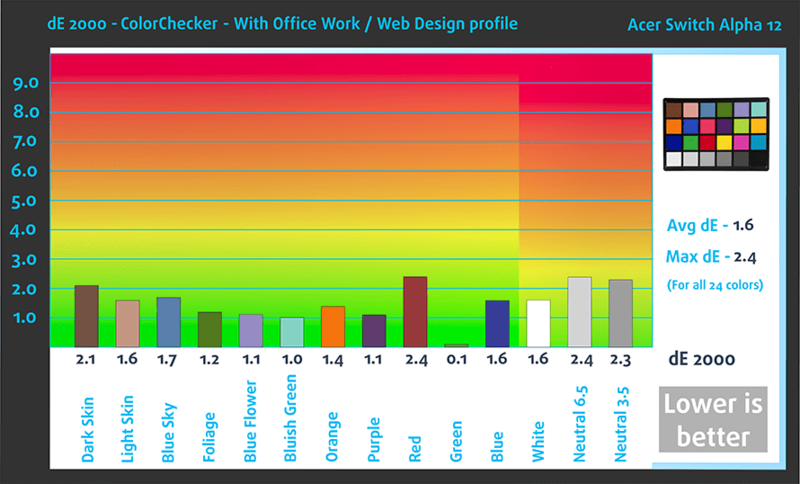 The maximum color deviation dE2000 is 3.8 in the upper-left corner and keep in mind that values above 4.0 are unwanted. 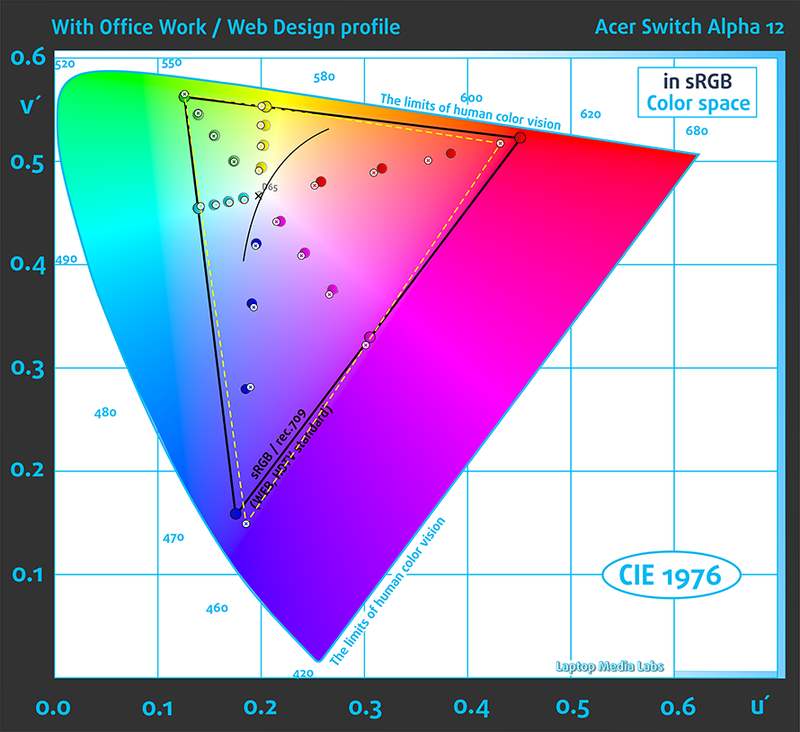 As you can see in the graph below, the display (yellow dotted line) covers 94% of the sRGB color space. The profile has been set at 140 cd/m2 brightness, D65 (6500K) white point and sRGB mode. The contrast ratio is 800:1 before calibration and goes down to 680:1 after calibration. Unfortunately, despite the good image quality, the display uses PWM from 0 to 100% screen brightness and the frequency of the emitted light is just 1 kHz and may affect users with sensitive eyes. As higher the frequency gets, the lower the impact on one’s eyesight is and 1 kHz is a relatively low frequency. The panel sure does have its strong sides like wide sRGB coverage, decent contrast – although it becomes subpar after calibration – and bright enough backlight to deliver good visibility outdoors. It’s excellent for general multimedia and browsing, which is the purpose of this device anyway. However, its weak spots can’t be overlooked like the gamma, colder white point and the presence of PWM from 0 to 99% luminance. These values can be fixed, though, if the screen is equipped with one of our custom tailored profiles. The device has good front-facing stereo speakers, which are as loud as you want them to be. Still, we’ve noticed some slight distortions at high and low frequencies. The unit arrived with Windows 10 (64-bit) already installed. 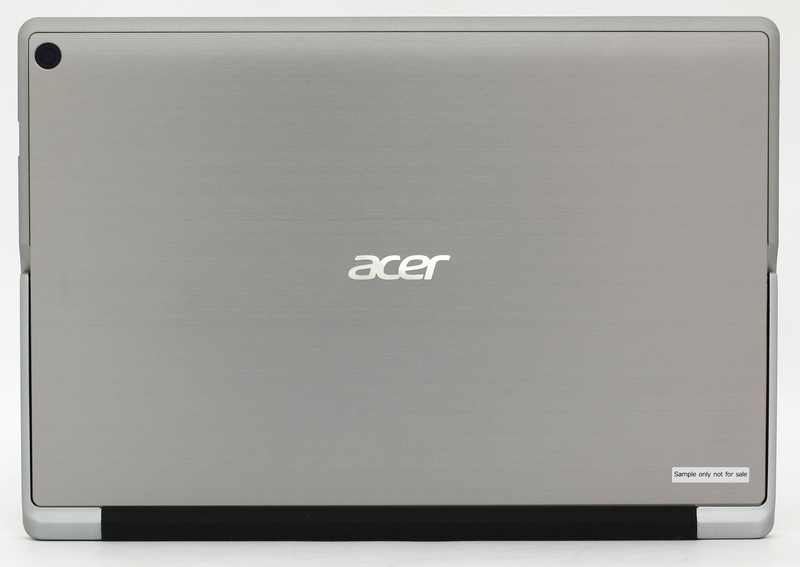 You can do that by yourself if you want but download the latest drivers from Acer’s official website. The battery on the device isn’t the biggest we’ve seen in a 12-inch device or a notebook at this price range but interestingly, it seems to be enough to support the system for longer than we’ve expected. The 37Wh battery holds up pretty well in our browsing test but doesn’t score impressive runtime on the video playback test. Still, the latter is enough to enjoy a few episodes of your favorite TV show. The good results might be on the small screen diagonal, although the pixels are a lot, and the use of a passive cooling system for the already efficient Core i5-6200U CPU. All tests were performed using the same conditions as always – Wi-Fi turned on, battery saver turoned on and screen brightness set to 120 cd/m2. Excellent battery performance when it comes to web browsing – 523 minutes (8 hours and 43 minutes). Considerably lower result but still on par with the competition – 341 minutes (5 hours and 41 minute). As expected, the gaming test took a toll on the battery but still scored pretty well with 215 minutes (3 hours and 35 minutes) of play time. Although this device isn’t designed for continuous and heavy workload, we perform this two-staged test to make sure the cooling system is reliable enough in the long run. Also, we were pretty curious to see how the device will handle 100% CPU and 100% GPU load because of the liquid-cooled Core i5-6200U chip. It’s definitely something you don’t see every day. We started off with 100% CPU load for about an hour and to be honest, we were quite surprised by the results. The chip maintained maximum operating frequency for two active cores (2.7 GHz) for the better part of the test. 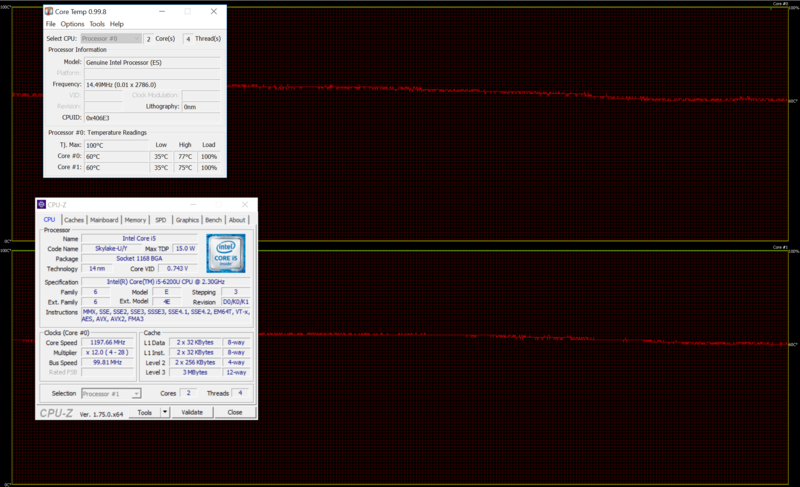 Then the chip started running at 2.4 – 2.6 GHz but still no thermal throttling. Another great surprise was the fact that the silicone didn’t go above 75 °C and this is just an outstanding result for a passive cooling system with a Core-U CPU. After an hour or so, we turned on the GPU torture test as well but things changed ever so slightly. The CPU downclocked to 1.4 GHz in order to give some headroom for the GPU to perform but the temperature of the silicone remained stable at around 60 °C. This kind of throttling is quite normal and occurs on normal cooling designs and 15-inch laptops as well. 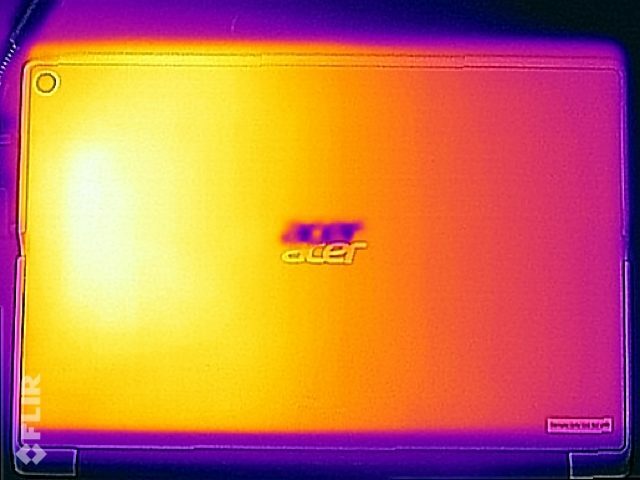 Acer’s LiquidLoop cooling design seems to do its job pretty well and passed our test with flying colors. 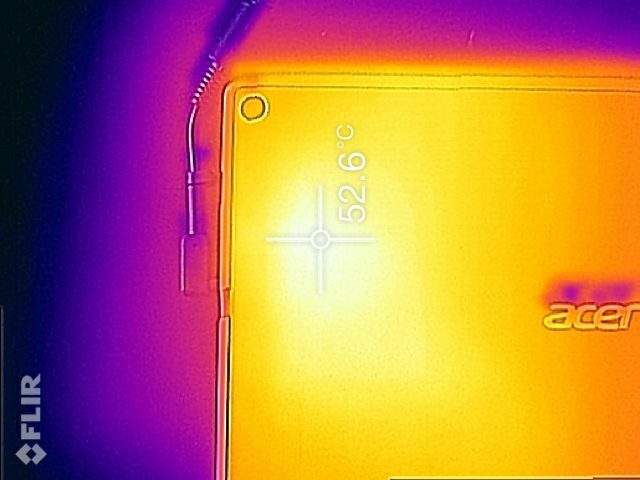 We’ve also measured the back of the device during the 100% CPU and 100% GPU load to see how hot it gets. And although the heat unbearable on the back, we would like to remind you that the extreme nature of the test doesn’t represent real-life usage. 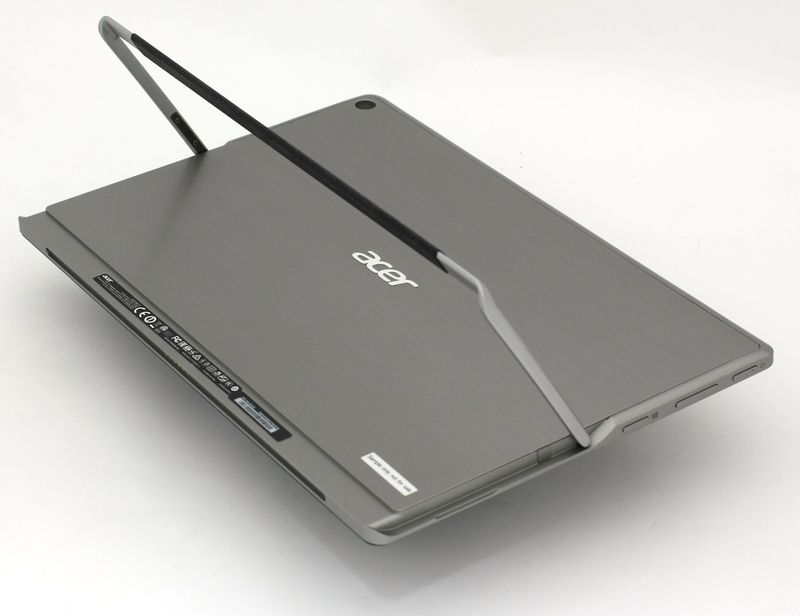 The general user won’t be able to reach such high temperatures during normal use and besides, if it gets that hot, you will probably be using it in laptop mode and you won’t feel the heat on the back. Anyway, the highest temperature we measured on the back was 52.6 °C. The performance and form factor of this device puts it in a category of its own and on par with Microsoft’s premium Surface Pro 4. In terms of design and build quality, the 2-in-1 device is just flawless – rigid and premium construction with easy to snap keyboard dock. It’s really comfortable to use not only as a notebook but as a tablet as well. Too bad not all markets will receive the docking with LED illumination and stylus included in the package. Keep an eye for those two features before buying if they are of great importance to you. 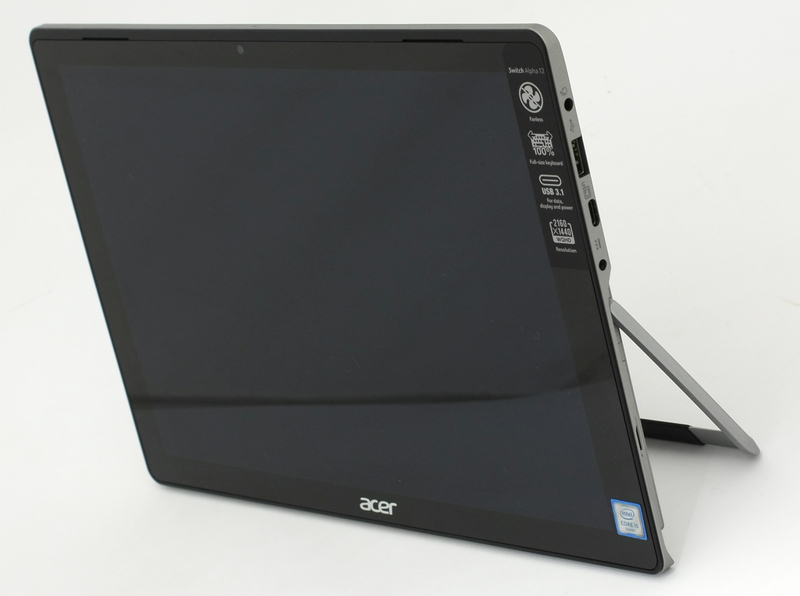 As Acer accurately advertised, the device is capable of handling more demanding tasks and the performance is on par with a normal 15-inch laptop. The LiquidLoop cooling system is excellent and withstood our extreme test quite well. Apart from raw performance, the device offers good multimedia experience too. The display covers almost all of the sRGB gamut, it has high contrast ratio and it’s bright enough for outdoor use. And despite the pixel-packed QHD panel, Acer’s Switch Alpha 12 delivers excellent battery life, particularly on web browsing test. We can’t miss mentioning, though, that the display uses PWM across all brightness levels and the frequency of the emitted light is relatively low and thus has a bigger impact on one’s eyesight. Nevertheless, this can be avoided when using our Health-Guard profile. 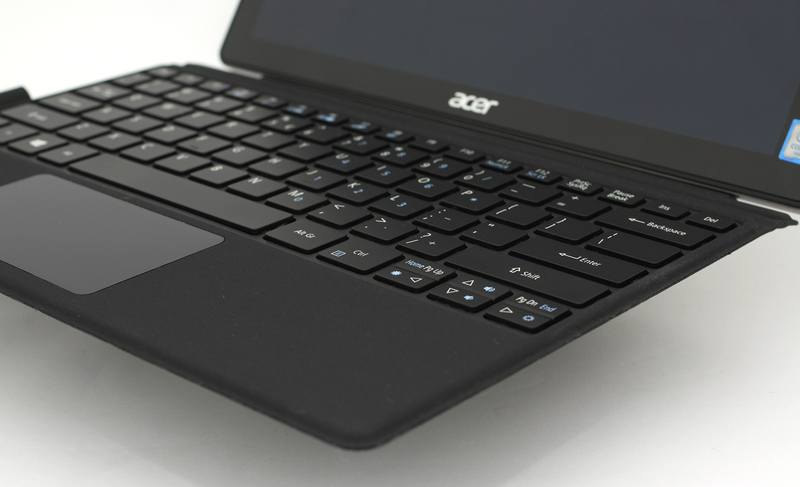 At the end of the day, the Acer Aspire Switch Alpha 12 can be an excellent substitute for your 15-inch laptop while offering the best of both worlds – the performance of a regular notebook and the portability of a standard 12-inch 2-in-1 device. The only problem you might have with this device is the limited connectivity options. If you buy yourself a USB-C to normal USB hub, though, this small issue can be resolved.